Michael were profiled in our December 2006 Cover Story), Bill Hammack (NewOrleans.com), Tommy Butler (Glasgow.com) and Gordon Borrell (Borrell Associates). 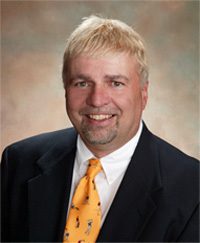 In addition, Andrew Martin has been named Executive Director of GeoPublishers.com. Martin brings extensive corporate and non-profit experience to his new role and is currently in charge of the conference division at renowned local media research firm Borrell Associates. Several of the new organization's founders had leadership roles or were prominent members at Associated Cities, the geodomain trade association for .com city domain owners that has been staging an annual GeoDomain Expo (the last of which was held in April 2010 in New Orleans). Despite the success of its conference, Associated Cities has been plagued by widely publicized internal battles between some of its co-founders that has made it difficult for the organization to function as smoothly as some had hoped. GeoPublishers.com will start fresh with a new concept that will include offering membership to those who own geo or geo-targeted domains or websites in any extension. The organization plans to provide its members with a wide array of benefits and services including local market data from Borrell Associates, the opportunity to participate in co-op advertising deals, the GeoPublishers Newsletter, legal information, a jobs board and marketplace and more. 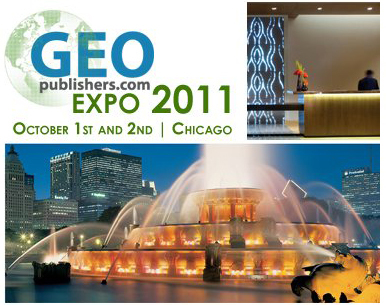 There will also be an annual Geo Publishers Expo with the inaugural conference to be held Sept. 30 through Oct. 2, 2011 at the Chicago Fairmont. The association's president, Fred Mercaldo, said "The on-line Geo Publishing industry is skyrocketing and the need for this trade association is obvious. We will provide our members with many unique benefits including the sharing of information, interaction with the industry's most successful and innovative leaders and many other strategic initiatives. The GeoPublishers.com Board of Directors, along with our various committees, consist of some of the most impressive executives ever assembled in the history of the Geo Publishing industry. Our membership already includes publishing titans such as McClatchy Newspapers and Morris Communications. I encourage all in the Geo Publishing industry to visit www.GeoPublishers.com and join today!" With a charter membership role of over 200 geodomain websites already onboard and such a formidable array of leadership talent driving the organization, GeoPublishers.com will clearly be a force to be reckoned with in the geodomain space - a sector that I have always felt offers one of the greatest opportunities in the domain investment and internet business development world. All forms of local media continue to gravitate toward the web and in my opinion good geodomains provide the perfect platforms to take advantage of that historic shift.